Blind Depot is family-owned and operated in Beautiful Naples, Florida. Since opening in 1995, we’ve treated every customer like they were a part of our family. Other companies may offer similar services, but our services come with a personal touch. Most Blinds are installed in 2 weeks from time of order. From 1 to 100 blinds... Never a charge for Installation. 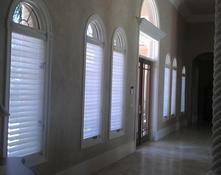 We also repair Hunter Douglas and other High Quality Blinds.